Detroit has been a hub of activity in the state of Michigan since the state was formed. Like all big cities in the US, there are a lot of events that are constantly going on in Detroit. Everyday there is some form of sporting event, conference, and concert. Detroit has an abundance of concert venues from The Detroit Opera House to the Fox Theatre. The newest venue is the Little Caesars Arena that is the hockey stadium for the Red Wings and also doubles as an event center. Little Caesars has replaced the Joe Louis Arena for the home of the Red Wings and for a concert venue. The Joe Louis Arena was built in 1979 and replaced the Detroit Olympia. 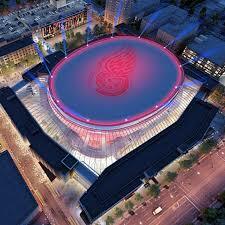 The Joe Louis Arena was the 2nd oldest hockey arena in the U.S. with only Madison Square Garden being older. The Arena hosted many other things besides just hockey games. They hosted figure skating competitions, basketball games and tournaments, and concerts. In 1980, the Palace of Auburn was built and had taken over a lot of the concerts that the Joe Louis Arena used to hold. The Little Caesars Arena opened in September 2017. It succeeded both the Joe Louis Arena and the Palace of Auburn Hills as the home of the Detroit Red Wings and the home of the Detroit Pistons. Like both the Palace and the Joe Louis Arena, the Little Caesars arena is also a concert venue, and it is now the only of the three venues that hosts concerts as well. The Arena has a capacity of 22,000 for concerts, 20,000 for basketball games, and 19,000 for hockey games. This is bigger than the Joe Louis Arena by about 1,000 seats. As Detroit grows and the sports teams become more popular, the stadiums and arenas increase in size. The transition from the Joe Louis Arena to the Little Caesars arena is a perfect example of this because not only is the Little Caesars Arena bigger than the Joe Louis Arena, it also has newer amenities and a newer look.